One of Murphy’s Laws plagues me repeatedly: If I aspire to pack a lunch, I am out of bread. So I ride my bike to the local store. There is no better time machine than pedaling on a sunny morning, the fragrance of cut grass and hot blacktop whooshing past. As a child, I gloried in my role as Mom’s personal shopper for bread, milk and tomato soup – especially if I could keep the change. Charlie’s Store bore no sign, but everyone knew who conducted business in the 1940s-style building at the crossroads. The pop machine held a place of honor just inside. Opening it cooled me, even if I didn’t have a dime. 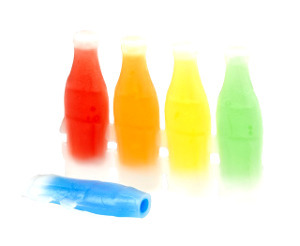 Rows of bottles swam in ice-cold water: root beer, Upper 10, Nehi Grape, Orange Crush, and cherry red pop everyone called cream soda, though it wasn’t creamy. I clinked bottles until I could haul out my choice. If I struggled to open it, some nearby grown-up popped off the cap. If I had accumulated that much wealth, though, I craved nickel candy bars that stuck to my skinny ribs. During leaner times, I bought penny candy. Though crusty, Charlie allowed herds of kids behind his counter, where we spent more time pondering choices than doing our homework. Boxes of Tootsie Pops, Pixy Stix®, licorice, root beer barrels, wax lips and Lemonheads lined the wall. Lik-M-Aid turned palms and tongues green, orange and purple. Atomic FireBalls, though not radioactive, exerted a similar effect on teeth and digestive systems. Even the poorest kid could hunt for empty pop bottles, exchange them for a penny, and join the sticky masses in licking, sucking and gulping. Charlie sold Bazooka Bubble Gum, two for a penny. Some steamy days, I sat on the store’s cool, uneven cement steps, chewing four pieces and reading comics. Fifty-five years have passed. I can’t pedal there today. The checkers at my present hometown store greet me with a friendly “how’s it going?” The aisles bulge with food, clothing, canning jars, hardware, birdhouse chimes and roach killer. I dutifully visit the bread rack. Sweet old friends greet me from jars and displays near the registers. I purchase a piece of Bazooka Bubble Gum. Chewing, pedaling and dangling my bag from the handlebars, I ride home, where (sigh) chores await. But I am glad for my neighbors’ flowers, thankful for the blue sky that hasn’t changed, though I have. Hungry Hubby, too, appreciates my trip to the store. Sometimes Murphy’s Law isn’t so bad. As a child, where did you buy your bubble gum? This entry was posted in Coffee Corner and tagged Candy, children, General Store, Humor, nostalgia, Rachael O. Phillips on May 24, 2017 by rachael. I could walk to Shorty’s. Besides the pops you mentioned (everyone in southern Indiana refers to soda as pop) we could also buy RC Cola or Double Cola. Chips and fudgies (chocolate ice cream on a stick) were also a delight. I couldn’t walk or bike to it, but another favorite childhood store was Honey Jones Trading Post. I went to school with his grandkids. I was so envious of them. They could have whatever treat they wanted, with NO money!!! Sometimes, if I was visiting Rita and Rusty, we would walk next door to the store and Honey would give me something for free too. It was a child’s dream come true! Isn’t it fun to remember those days when a nickel candy bar would fill a hungry little stomach, and a dollar was wealth beyond our wildest dreams! Somehow, it doesn’t seem fair that now when we have several dollars in our billfolds, we buy salads with diet dressing. Where’s the justice in that?